My drive from Ohio to visit family in Iowa doubles as a tour of the clean energy economy, with familiar stretches of wind farms and a recent proliferation of solar arrays. A new report provides data to go along with what my eyes can see: Renewable energy is transforming parts of the rural Midwest. I’m Dan Gearino, your guide to the clean energy economy. Send me questions, comments and news tips at dan.gearino@insideclimatenews.org. Thanks for reading! The number of clean energy jobs is growing across the Midwest, and those gains are helping rural areas, according to a report issued today by the Natural Resources Defense Council. Arjun Krishnaswami, co-author of the report and an NRDC analyst, told me one reason he wanted to do this analysis is that much of the country has been slow to realize how clean energy is changing the economies of the Midwest, especially the rural Midwest. “I think there should be more people talking about it,” he said. Even within the energy sector, he thinks a perception remains that the clean energy economy is mostly a coastal phenomenon. A key point: Rural areas often struggle to attract jobs. The report shows that rural job growth was 1.4 percent or less in Midwestern states in 2016 from the year before, with a few states seeing a net loss of jobs. In contrast, clean energy jobs grew by more than 5 percent that year in each Midwestern state except Kansas and South Dakota. In each of 12 states (Illinois, Indiana, Iowa, Kansas, Michigan, Minnesota, Missouri, Nebraska, North Dakota, Ohio, South Dakota and Wisconsin), the percentage of clean energy jobs in rural areas is greater than the percentage of urban clean energy jobs. Most large wind and solar projects are located in rural areas. 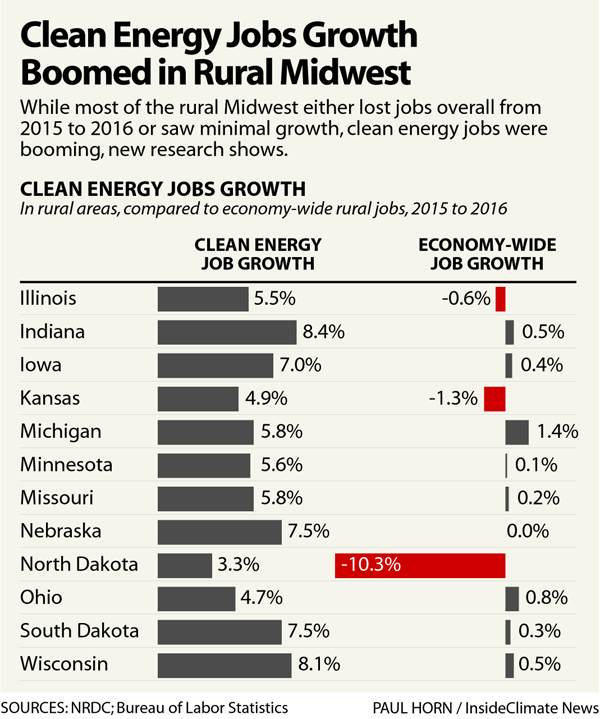 All but two Midwestern states have more rural clean energy jobs than rural fossil fuel jobs. The exceptions are North Dakota, which isn’t surprising considering the state’s Bakken oil region, and Kansas, where fossil fuel jobs have a slight edge. 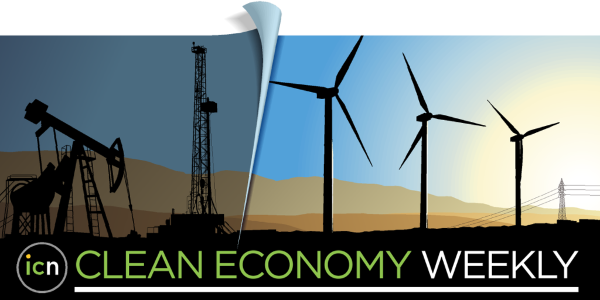 The difference is noteworthy in Ohio, which has seen growth in shale oil and gas jobs, but its rural fossil fuel jobs are 1 percent compared to 2 percent for clean energy jobs. Michigan is a clean energy leader. There are 24,512 clean energy jobs in rural Michigan, accounting for 4.2 percent of all jobs there, the highest rural share of the 12 states, based on 2017 figures. The next highest is Wisconsin, with 3.3 percent. Michigan is the regional leader in jobs related to electric vehicles and has a substantial number of jobs in energy efficiency and in operating renewable energy systems, Krishnaswami said. This is a good sign for a state that has long been an industrial leader but also has periodic struggles with layoffs from its automakers, as is happening right now with the announcement of plant closings from General Motors. Read my full story on this here. Xcel Energy, one of the country’s largest utility companies, announced it will eliminate all fossil fuels from its generating fleet by 2050, the first major utility to make this pledge. This follows last month’s election of Democrat Jared Polis as governor of Colorado, and it bodes well for his plan to have the state get 100 percent of its electricity from renewable energy by 2040. Xcel’s commitment applies to its entire territory, which includes parts of Colorado, Michigan, Minnesota, New Mexico, North Dakota, South Dakota, Texas and Wisconsin. “This is an extraordinary time to work in the energy industry, as we’re providing customers more low-cost clean energy than we could have imagined a decade ago,” said Ben Fowke, chairman, president and CEO, in a statement. Clean energy advocates greeted this news as a major milestone. “Xcel Energy’s announcement is proof that getting serious about cutting pollution and investing in clean energy is smart for business, local economies, and jobs,” said Mary Anne Hitt, senior director of the Sierra Club’s Beyond Coal campaign, in a statement. This is a pledge to rely 100 percent on carbon-free sources of electricity, and not to rely exclusively on renewable energy. The distinction: “Carbon free” can include nuclear and other technologies such as batteries. Even though Xcel is not commiting to 100 percent renewable energy, it still could meet that target within Colorado, an essential part of Polis’ plan. I am sometimes wary of utilities making pledges that will take decades to fulfill because the clean energy transition and the need to address climate change are both moving much more quickly. That said, Xcel’s plan is a notable step in utilities’ shift toward a business model that does not include fossil fuels. New Hampshire regulators appear likely to approve a utility’s plan to set up energy storage systems in its customers’ homes. The proposal from Liberty Utilities is small. The company has about 40,000 electricity customers in the state, and the plan would initially serve up to 200 of them. The larger significance is that this is a step toward utilities playing a role in deploying home battery systems. Liberty’s plan has been controversial in part because the company would own the batteries, drawing opposition from competitors that sell battery systems. Liberty reached a settlement last week with most of the other parties in a case before state regulators. The settlement does not guarantee final approval, but makes it likely. 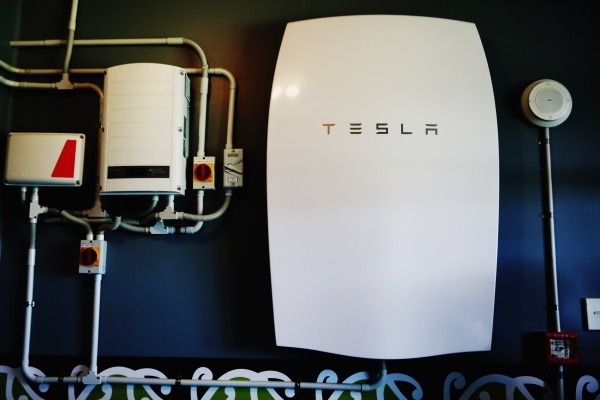 Customers would be able to use the batteries as they want for backup power to use during outages and to store electricity from rooftop solar. During periods of peak demand Liberty would have the ability to remotely take control of the systems and use the power to reduce stress on the grid. “The utility’s insistence on owning batteries makes it an outlier nationally, but the program as a whole puts Liberty at the cutting-edge on the battery use case," Chris Rauscher of Sunrun, a company that sells solar and storage systems, told Utility Dive. Sunrun was among the companies opposing the plan. Utilities, with a model that charges consumers for just about any expense, are well-positioned to lead the way on storage. This is a project to watch going forward. That’s also true of a solar and storage project going on next door in Vermont, where the utility Green Mountain Power is moving forward with a plan to deploy 2,000 Powerwalls, following a pilot project with about 500 of the batteries. 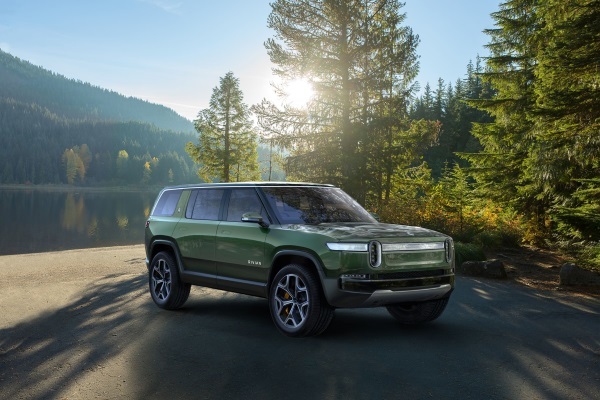 Rivian, a Michigan startup, got an abundance of news coverage last week for the rollout of its all-electric pickup truck at the Los Angeles International Auto Show. Leading the way for Rivian is CEO R.J. Scaringe who sees an opening in a market where Ford, General Motors and Fiat Chrysler get the bulk of their profits from trucks, and have no strong all-electric competition. Tesla also is working on an all-electric truck. In an interview with Reuters, Scaringe said that the country’s top-selling trucks “don’t drive particularly well, don’t handle particularly well, have fuel economy that’s really quite bad." His company’s future rests on the idea that truck buyers want an all-electric option. I am eager to see whether that’s true.